Did you know a cockroach can fit into areas thin as a dime? They can bend their bodies in more ways than you can imagine which enables them to squeeze through holes, cracks and areas as thin as a dime. With that being said we are going to help you identify the go-to hiding places for cockroaches. Kitchen pantries and cabinets are one of the first places cockroaches like to visit since they love dark places and they can spot crumbs. Keeping your food in sealed air-tight containers is a great practice. We all love movie snacks! When snacks fall between the couch cushions it makes a great snack for cockroaches. Dark cracks in furniture create a safe environment for them to lay eggs. Vacuuming furniture regularly will help keep cockroaches away. We all love hanging around but cockroaches bring that to a whole new level. They enjoy hanging in ceiling corners, which would have you wanting to look up. Or not! Look out for cracks in the ceiling and seal these areas to help keep cockroaches away. Cockroaches are found of dark and wet areas. Pipes create that perfect environment. Which is why you should check for leaks regularly and ensure that pipes are well insulated. 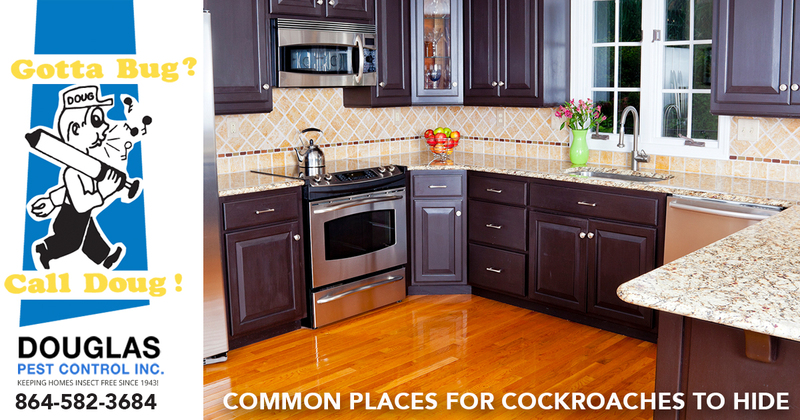 Large appliances such as ovens and refrigerators provide a dark place for cockroaches to nest. They also love to hang out behind smaller appliances like your microwave and toaster where they can find crumbs. Cleaning regularly behind and under your appliances is beneficial. Everyone loves a cuddle partner and for cockroaches nuzzling between trim and molding creates the same sensation. Check your moldings to ensure there aren’t any cracks. You don’t want them hiding there. Contact your Spartanburg exterminator, Gotta Bug Call Doug at (864) 582-DOUG to eliminate unwanted pests (cockroaches, ants, termites and rodents) and for your personalized treatment plan.